Effects of antibiotic and phytogenic feed additives on broilers infected with Eimeria spp. At the annual meeting of the Poultry Science Association (PSA), the main topic to be discussed was the future direction of poultry production. Challenges that the industry is facing worldwide are the reduction of antibiotics, alternative means of production and operational productivity. Consumers today are better informed and consequently demand more transparency and greater responsibility in establishing forms of husbandry that promote animal welfare. In the light of these topics, Dr. Eckel presented the latest research results of its highly effective feed additive Anta®Phyt. With its phytogenic ingredients from hops, liquorice and arabic gum, Anta®Phyt supports a healthy gut flora and has antibacterial effects, especially against gram positive bacteria. 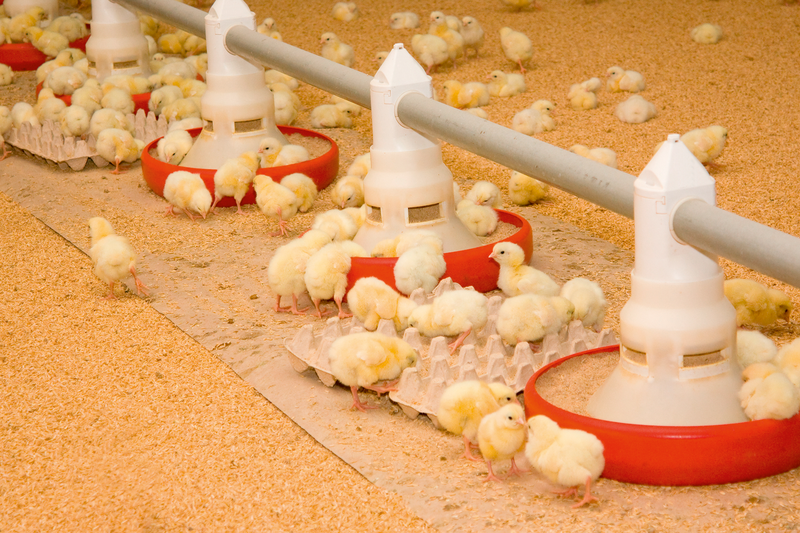 A recent broiler feeding test in Peru, which compared Anta®Phyt with feed groups with and without antibiotic growth promoters (AGPs), showed that the phytogenic feed additive has significant benefits over AGPs in terms of feed efficiency, performance and animal health. Reducing antibiotic growth promoters (AGPs) is a key factor in increasing the sustainability of broiler production. A suitable AGP replacement should protect animals from negative effects and improve the health of the digestive system. Effective phytogenic feed additives can achieve this. The effect of the phytogenic feed additive Anta®Phyt MO on the performance and gut health of broilers infected with Eimeria spp. was investigated in this study. The aim was to demonstrate the impact of the phytogenic additive in comparison to a negative control (NC) group and a positive control (PC) group with an AGP programme during the induced dysbiosis. A total of 1,020 one-day old broiler chicks (ROSS 308) were randomly divided into three dietary treatment groups. All birds were fed in two nutritional phases (starter: 1–21 d and grower: 22–40 d) with a maize-soybean-meal-based diet in mash form. No additive was included in the NC group’s diet, while AGPs with coccidiostats were included in the PC group’s diet. The third group received a phytogenic feed additive (NC + 300 g/t Anta®Phyt MO, Dr. Eckel Animal Nutrition GmbH & Co. KG). Each group comprised 340 birds. On day 14, all birds were infected with a vaccinal strain of Eimeria spp. The pathogens were administered orally in the drinking water. The associated infections and intestinal immune response were assessed in terms of performance (21 d and 40 d) and gut health factors (21 d). The one-way ANOVA was used for statistical analysis. The daily weight gain in the phytogenic group was significantly higher than that in the PC group over the 40-day trial. Additionally, a better FCR was observed and the mortality was lower in comparison to the NC and PC groups (Fig. 1). Fig. 1: Daily weight gain, FCR and mortality in the NC (no additive), PC (AGP) and Anta®Phyt MO (*p < 0.05) groups. The improvement in performance results in an enhanced European Production Efficiency Factor (EPEF) in the group receiving Anta®Phyt MO (458) compared to the NC (445) and PC (438) groups. In terms of intestinal health, birds receiving the phytogenic additive had numerically longer intestines compared to the NC and PC groups (Fig. 2). Fig. 2: Intestinal length of broilers in the NC (no additive), PC (AGP) and Anta®Phyt MO groups. Anta®Phyt MO increases broiler performance during Eimeria spp. infection. The phytogenic feed additive shows better effects than an AGP programme in terms of weight gain, FCR, mortality and gut health. 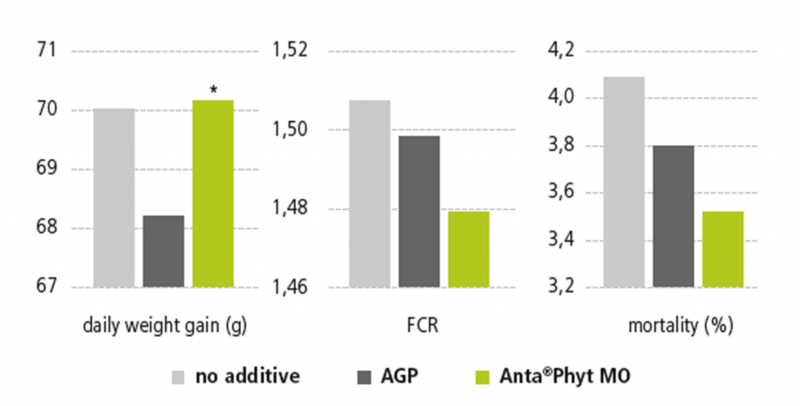 Consequently, phytogenic feed additives such as Anta®Phyt MO appear to be a beneficial and more sustainable alternative to the investigated AGP programme.